Regular Sensible 33 Regular Sensible 33 for adult cats from 1 - 7 years old. Digestive sensitivity. Some cats have digestive sensitivity leading to soft stools. SENSIBLE 33 contains an exclusive combination of nutrients to support optimal digestive security (L.I.P. *) and prebiotics for a balanced intestinal flora. *L.I.P. : protein selected for its very high digestibility. 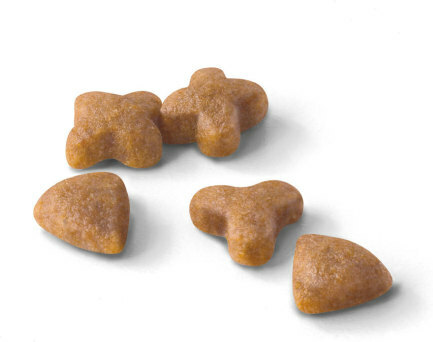 Three different kibble shapes and carefully selected flavourings to stimulate food intake in sensitive cats. 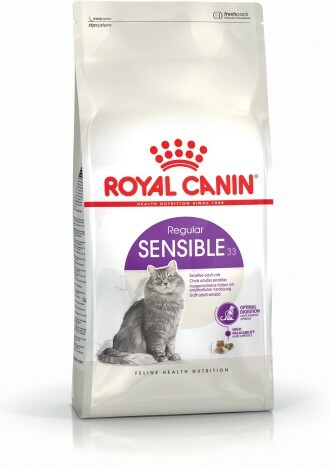 For cats requiring a higher energy density. Dehydrated poultry protein, rice, animal fats, maize, vegetable protein isolate*, dehydrated pork protein, wheat flour, wheat, hydrolysed animal proteins, maize gluten, yeasts and parts thereof, beet pulp, minerals, fish oil, vegetable fibres, soya oil, fructo-oligo-saccharides. Crude ash: 7.4%. Crude fibre: 1.6%. Crude oil fats: 22%. Moisture: 0%. Protein: 33%. Vitamin A: 18500 IU, Vitamin D3: 1000 IU, E1 (Iron): 38 mg, E2 (Iodine): 3.8 mg, E4 (Copper): 12 mg, E5 (Manganese): 50 mg, E6 (Zinc): 150 mg, E8 (Selenium): 0.1 mg - Technological additives: Clinoptilolite of sedimentary origin: 5 g - Zootechnical additives: Ammonium chloride: 5 g - Preservatives - Antioxidants. *L.I.P. : protein selected for its very high assimilation.